Punjab posted their second innings win in as many matches, surging to the top of Group A with 14 points. 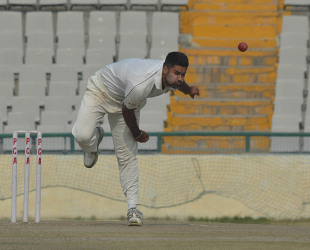 Manpreet Gony took his sixth five-for, and Siddarth Kaul chipped in with four wickets. Laxmi Shukla and Wriddhiman Saha provided resistance again, but their 111-run stand for the seventh wicket only delayed what seemed inevitable. This was Saha's fourth fifty in four innings this Ranji season. Punjab had a great start to the day when they took the first four wickets for the addition of just 14 runs to Bengal's overnight 25 for 1. From 39 for 4, Bengal needed a miracle, and the 63-run partnership between Manoj Tiwary and Saha wasn't one. Shukla and Saha, though, threatened Punjab a little, but Bipul Sharma bowled Saha to provide the final turn. Gony came back to run through the rest, and Shukla was left stranded on 91. Ravindra Jadeja joined VVS Laxman and Wasim Jaffer as the only men to have scored two triple-centuries in Ranji Trophy as Saurashtra overhauled Gujarat's 600 to take three points in Surat. There were many other records that fell by the way side. Jadeja's 539-run stand, with Sagar Jogiyani who scored his career-best 282, was the highest for a third wicket in Ranji Trophy, and fell 38 short of the overall record, between Vijay Hazare and Gul Mohammad in the pre-independence era. The partnership lasted 125.1 overs, and between them Jadeja and Jogiyani hit 72 fours and six sixes. This is the second consecutive Ranji season that Jadeja has begun with a triple-century. Last year, though, Saurashtra couldn't bowl out the team batting second, and had to do without any points. Jadeja's first-class average has now reached 51.44. Gujarat tried nine bowlers but without any success. The only wicket to fall came through a run-out. Only Parthiv Patel and Smit Patel didn't bowl. Madhya Pradesh began the day needing 77 to claim three points, and the overnight pair of Devendra Bundela and Jalaj Saxena duly took them to those three points. After that, it was all a matter of batting practice and Saxena's pursuit of his fifth first-class century. Saxena did so, and went on to match captain Bundela's score of 142. Shortly after he got out, Madhya Pradesh declared the innings closed. Hyderabad batted eight overs for eight runs before the two teams agreed to call the game off. Mumbai began the day needing 119 with seven wickets in hand to get the three first-innings points from this flat track in Jaipur. Despite a wobble midway during the remainder of the chase, they reached there with four wickets remaining. After the target was achieved mid-afternoon, the rest of the day was for batting practice and for Abhishek Nayar to complete his second century in as many matches this season. Nayar's first 34 runs, though, were pretty crucial. Mumbai had lost three quick wickets to go from 402 for 3 to 420 for 6, and still needed 59 when Nayar and Ankeet Chavan came together. They batted cautiously to take Mumbai to the lead. Despite the falling wickets at the other end, Nayar reached his century with No. 11 Shardul Thakur for company. The match was called off as soon as Thakur got out.